iSmart Next Gen is an integrated solution. It consists of Hardware housed in a 10.4” Head Unit that acts as the control centre. Integrated within the system is the OS developed by MG India. iSmart comes with embedded connectivity solution, maps and navigation services, voice assistant, pre-loaded infotainment content, emergency and concierge services and built in apps. It also supports Over The Air (OTA) updates. The MG Hector Internet Car with iSmart Next Gen has been built in partnership with leading Global Technology companies, Cisco, Unlimit, Microsoft, Nuance, TomTom, Gaana, Accuweather, SAP, iTeligence, Adobe, Cognizant and Panasonic. MG Hector Internet car is a car that would understand and obey voice commands. A car that will always stay connected to the internet. A car that can be controlled remotely via mobile App. A car that has safety and security features never imagined before, from passenger safety to emergency response to cyber security. The system has built in Artificial Intelligence and Machine Learning capabilities to learn and improve user experiences over time. The first car in India that would keep upgrading with OTA updates. It is not just a car, it is a whole new experience in Connected Mobility. The brain of the system is housed in a large 10.4” Head Unit, the largest in its category of cars, bigger than most tablets available in the market. The Head Unit comes with preloaded entertainment content which will be refreshed periodically Over The Air (OTA). Consumers prefer to use their mobile devices vertically, which is why MG has mounted the Head Unit vertically. The beautifully designed head unit gives all the information at a glance which allows the user to control all vehicle functionalities with just a touch. The screen offers different themes, based on user preference. The screen has been built and tested for extreme climatic conditions prevalent in India. MG Hector iSmart Next Gen comes with in-built connectivity solution. It has an embedded Machine to Machine (M2M) eSIM. The platform is Internet Protocol Version 6 (IPV6) and 5G ready.This is the first car in the segment to be launched with such a sim. Unlimit has worked closely with Cisco on their Jasper platform to develop a robust solution that stays connected. Airtel is the telecom partner for connectivity. The connected mobility solution makes possible several services for the Head Unit, Vehicle Functions & Remote operations through iSMART environment. 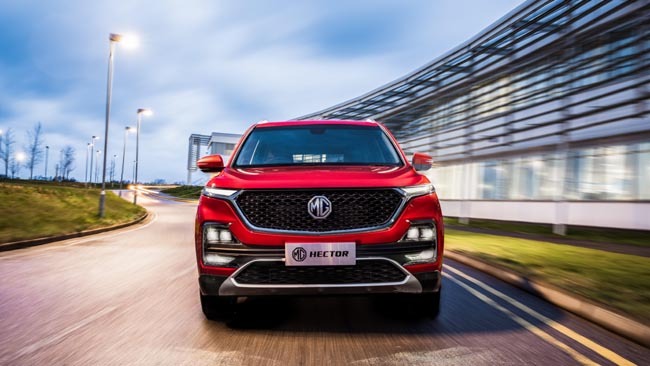 The connectivity solution has been developed by MG in Thailand, China and India and is set to go west as the first truly Connected MG program, starting with UK later in 2019. The solution gets continuous upgrades thanks to Cisco’s development around the world and Unlimit’s continuous development for MG India. All such development and upgrades would be available on the iSmart system as they are released globally. This will make sure the system is always up to date. Connected Mobility solution in MG cars would make possible a number of services like remote tracking and location, geo fencing, automated emergency response, music and content streaming, geo fencing, up to date maps, real time navigation, control via mobile app and most importantly Over The Air Updates. MG India is introducing OTA feature for the first time in India. This will make sure MG cars get updated as when new updates are available. Much like on smartphones or tablets. Thus, the system would periodically receive new look and themes for the screen, new infotainment content and updates to maps to keep them latest always. The updates would also include updates for OS and Firmware.The vehicle will have the ability to receive new features and upgrades from time to time via OTA. Smartphones have developed significantly in the last decade, thanks to frequent updates. MG iSmart is making a beginning with OTA for cars. Developers and partners over time would be able to bring in many more features and services, unimaginable today. All available to MG car owners via a simple update. This presents immense exciting possibilities. Data related to driver and vehicle analytics, will be stored locally in the Microsoft Azure Cloud DC in India. The platform provides an impregnable defence to the system and all data stored. MG has been working with Microsoft around the world to ensure utmost standards of cyber security are available to our environment. MG has been working with Microsoft around the world to ensure utmost standards of cyber security are available to our system. Like all other components of the iSmart System, cyber security is also regularly updated to provide protection against all future threats. MG Hector iSmart system comes with a cloud enabled, AI based Voice Assistant, enabling over 100 voice commands to control the vehicle. These include commands like open sun roof, Climate Control, open window, radio controls (AM, FM, DRM), inside the vehicle, search embedded songs and navigate to places. This Voice Assistant has been built for MG India by Nuance. The assistant has been trained for Indian English and accents. It has advanced AI enabled Machine Learning capability to learn and customise itself to each user over time. Apart from accents, the system also recognises differences in semantics in speech. This is the way each person constructs sentences. To overcome the challenge Nuance applied NLU learning (Natural language Understanding). It has adaptive feature – DDFW including voice recognition VoCon hybrid, TTS Vocalizer embedded and speech signal processing SSE for barge-in and beamforming for MG vehicles. All these technical terms simply mean, the best recognition of Indian voice and accents ever. The system would keep getting better with backend development and AI based learning. All such improvements would be available via OTA to the users. All MG cars would come with E-Call feature. This is an instant emergency response system.In case of a condition where airbags are deployed, E-Call is automatically triggered. A message via the connected system is transmitted with exact location, to a response team at Pulse Hub, MGs customer centre. Pulse Hub instantly calls to reach the vehicle’s Head Unit. If no response, calls the owners phone to check and if no response, calls the emergency contact. The MG Hector’s iSMART enables concierge services. When the I-call is pressed, a message is sent to a customer service agent at Pulse Hub. The agent calls the owner on his phone to enquire how they could help? Customer may place a range of requests that they may have while on the roads. These may include queries on finding locations on places. Pulse Hub not just guides but can also send POI (Point of Interest) onto the Head Unit of the car, where the navigation system takes on. A delightful experience that hands off seamlessly from technology to people to technology. MG Hector iSmart comes with embedded maps and navigation solution from TomTom, the global leaders in automotive navigation. TomTom has over 600 M vehicles on roads around the world using their solution. This solution has gained leadership because it provides always up-to-date maps and real time traffic data. The map and navigation data are updated real time with inputs from all the 600 million vehicles which allows TomTom to re-map large cities on a daily basis. TomTom also offersIQMaps, a feature that would make locating and navigating a lot simpler. MG Hector iSmart would be pre-loaded with the Gaana App and premium account with ad-free music and download capability. This would offer owners largest collection of latest music, smart playlists and personalised recommendations. Gaana has made full use of the large 10.4” Head Unit to offer more visibility to song artworks and added features that have made it easier to get entertained. This is a first of its kind car entertainment solution available in India. Accuweather App comes embedded in the system. It provides real time updates on weather at location. Thus, weather conditions are available always to the driver helping them take necessary action under inclement weather. Set geo fencing. Most useful when loved ones are travelling in the car. MG starts its relationship with a customer long before they have owned an MG. Their website and other digital assets allow customers to find all information at one place conveniently and know more as they desire. This seamless customer experience is provided via Adobe Experience Cloud. Adobe and Cognizant have worked close together to develop a digital experience for MG India never seen before with a cloud manufacturer in this market. The system will learn from customers and with time offer even more. MG India collaborates with SAP – the world leader in enterprise business software, to provide a connected customer experience on SAP’s next generation front-office suite. SAP enables MG Motors stakeholders be it their dealers, service centres or customers to remain connected on an integrated platform. With the seamless flow of real-time data across all the processes from marketing to pre-sales to sales to post-sales service. SAP technology empowers MG Motors to personalise, capture individual preferences and proactively address the choices of prospective customers whenever they are engaged with MG Motors. As and when the customer walks into a dealership for the information, their choices are easily recognized, captured and remembered. This state of art interaction updates the data real-time. Ensuring the customer does not have to repeat their queries or requests each time. Making it a smooth interaction and a lot faster for the customer to buy and own a MG Motor car. SAP’s world class DMS ensures proactive service reminders and required details of the car are available in the iSmart App. The intelligent system automatically alerts the service station when the car reaches recognising the requirements and notifying the dealer service representative. Customers can thereafter, monitor the progress of service status real-time and are alerted when the car is ready. SAP’s front office to back office integrated platform has given MG Motor India one of its kind connected customer experience. iTelligence implemented the SAP suite of solutions that have been designed to adapt multiple screen formats, from mobile phones, to tablets to computers and large display screens at the dealerships. Display solutions have been optimized by Panasonic.